The videos here are supplied at high quality: for the first three there are lower-quality versions (which download faster) available on youtube: links to these are provided under the description for each. 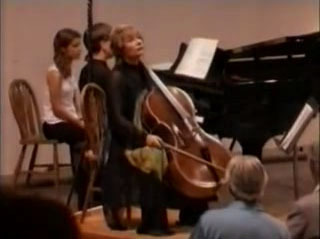 Karine Georgian and the late Vladimir Krainev play the slow movement of Rachmaninoffs Cello Sonata on the composers beloved family home, which he left for ever in 1918 but which still contains his furniture and his pianos, at Ivanovka deep in the Russian countryside. 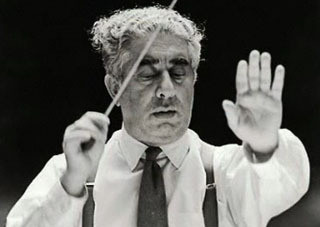 The cadenza and two last variations of Tchaikovskys Variations on a Rococo Theme performed live with the Moscow Philharmonic Orchestra conducted by Yuri Simonov. Signature 1975 recording of this virtuosic hymn to the rich treasury of Armenian folk melodies, conducted by the composer with his young compatriot Karine Georgian, Gold Medal winner of the Tchaikovsky Competition and former student of the man for whom it was written, Mstislav Rostropovich. 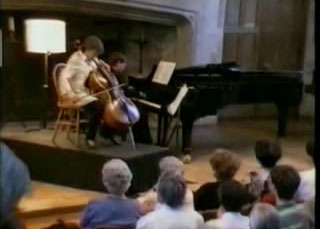 Private videocam recording from a live performance with Ian Munro of Barbers romantic, highly expressive Cello Sonata in the mediaeval Great Hall at Dartington in Devon during the 1996 International Summer School. Private videocam recording from a live performance with Ian Munro of one of Debussys last works, his Cello Sonata of 1915. This short sonata distils a lifetime of musical and emotional experience, infused with the composers deep sadness at the waste and suffering of the First World War. The recording was made in the mediaeval Great Hall at Dartington in Devon during the 1997 International Summer School. In order to reproduce a good sound quality, these video files are relatively large. They have been set up to start playing when part of the video has been downloaded, rather than waiting for the whole video. On slow connections this can result in interruptions: if this happens, the solution is to pause the playback while more of it downloads, and then either resume or backtrack using the slide indicator.